Students who major in leadership and organizational communication will graduate ready to excel in almost any workplace or even prepared to carve their own path in a world increasingly dependent on effective communication. You'll study theories of communication and leadership within organizations, small group dynamics, motivational techniques, interviewing skills and conflict management. You'll be encouraged to practice the problem-solving skills you acquire in internships and as a member of campus organizations or during activities on campus and in the community. You'll have the aptitude and attitude to become a respected manager in business, government or nonprofit organizations. Education Abroad opportunities that build global communication skills and perspective. Extensive on-campus and community activities that enhance multicultural and global learning and perspective, including a Players Performance Group based in the communication department. Committed faculty with extensive backgrounds either as a participant in or leader of international study opportunities in Europe, South America, Africa, Asia and Latin America. Diversity in internship experiences through a variety of businesses, nonprofits and charitable organizations. 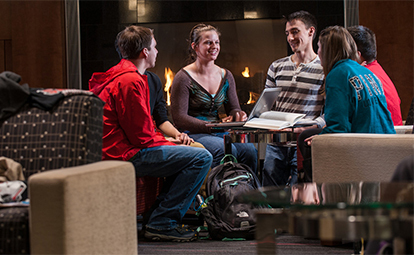 Active student groups are competitive, inclusive and provide leadership opportunities as well as social interaction. Core classes occur in smart classrooms in Riverview, the only campus building on the National Register of Historic Places. 10 scholarship funds focus on communications studies. One of the top 5 programs in degrees granted for 11 years. Faculty with established and ongoing research recognized in their fields of study, including the new 2014 textbook "Toxic Organizational Communications: Surviving Work" by professor Matthew Vorell. Notable alumnus: Justin Wampach '95 is owner, president and chief executive officer of Adjuvant Technologies, a provider of software for physician scheduling and an on-call management system, and co-founder and former president of Digital Green.